February Michigan Unemployment 5.9% – Really? Kurt Weiss at the Michigan Department of Technology, Management, and Budget (DTMB) reported on March 25th that Michigan’s February 2015 seasonally adjusted unemployment rate dropped to 5.9% from January’s 6.3% figure. This was followed on April 2nd by the DTMB release of non seasonal adjusted employment data for February 2015. This quite large one month drop is great news for Michigan workers, if it indeed reflects our labor market. But does it? The DTMB Michigan non seasonally adjusted (NSA) employment report for February 2015, at the bottom of page 6, showed that Michigan’s civilian labor force declined by 33,000 workers over the twelve preceding months. But the seasonally adjusted (SA) employment report for February 2015 at the top of page 2 showed that Michigan’s civilian labor force increased by 7,000 workers over the same twelve months. The growth of Michiganders employed over the same twelve month period also shows a 5,000 worker NSA/SA discrepancy: 101,000 not seasonally adjusted versus 96,000 seasonally adjusted. And the shrinkage of Michigan’s unemployed worker population over the same twelve month period shows a 46,000 worker NSA/SA discrepancy: 134,000 not seasonally adjusted versus 88,000 seasonally adjusted. Valid seasonal corrections should produce twelve month differentials which agree with comparable item non seasonally adjusted differentials over the same twelve month period. Here we have a 0.85% discrepancy in Michigan’s total civilian labor force, a 0.1% discrepancy in civilian employment over the same twelve month period, and a 12.5% discrepancy in the shrinkage of Michigan’s unemployed worker population over the same twelve month period. Note: The data in this release reflects recently revised historical estimates. Seasonally adjusted labor force estimates for 1976-2014 for Michigan and 1990-2014 for the Detroit-Warren-Dearborn MSA were revised. Previous published data should be replaced with this new series. In addition, seasonally adjusted payroll job data was revised for 2010-2014. For newly revised data, please contact DTMB at 313-456-3090. The DTMB February 2015 NSA employment report bears a similar note on its first page noting that it was also subjected to substantial revisions. So Michigan’s employment data has been subjected to substantial revisions at BLS which produce seasonal adjustments that do not cross check against comparable item non seasonally adjusted data over the most recent 12 month period. 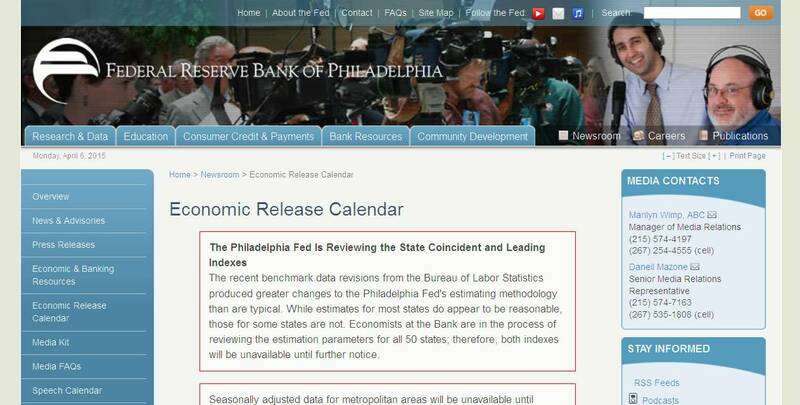 The recent benchmark data revisions from the Bureau of Labor Statistics produced greater changes to the Philadelphia Fed’s estimating methodology than are typical. While estimates for most states do appear to be reasonable, those for some states are not. Economists at the Bank are in the process of reviewing the estimation parameters for all 50 states; therefore, both indexes will be unavailable until further notice. This is a stunning statement. One group of government statisticians never, ever publicly criticizes the numbers of another group of government statisticians. They hash their issues out behind closed doors. Something is really wrong here. A number of observers have questioned the accuracy of BLS employment numbers, notably John Crudele at the NY Post The widely viewed subversive financial website Zero Hedge caught BLS overstating 2013 national job growth 40% by comparing the monthly BLS data releases to the JOLTS releases for that year. This forced BLS to make a massive 500,000 worker adjustment to the JOLTS data series, which may or may not have improved the data. BLS data skeptics point out that the BLS adjustments since October 2012 have consistently promoted President Obama’s talking points promoting a growing economy meme. Does this sound impartial and professional to you? Six days later Ms. Ashack developed ‘tweeter’s remorse’ and tried to claim that her account and computer were hacked, but only after her obnoxious political tweet aroused considerable indignation. Bottom Line: Recent BLS ‘adjustments’ have totally distorted the picture of Michigan’s current employment situation, preventing any realistic analysis of Michigan’s economy or its unemployment. DTMB cannot be faulted here; from a technical standpoint it makes perfect sense for all the states’ employment data to be adjusted by a single protocol so they remain comparable. 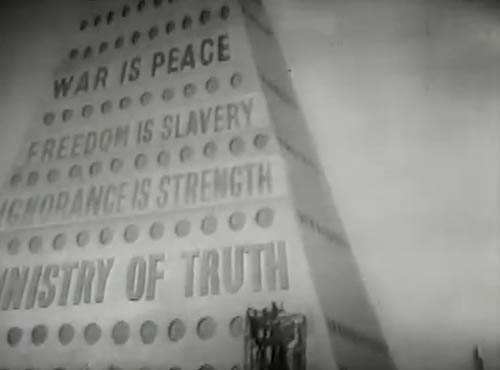 But BLS has become our national ‘Ministry of Truth’. Michigan’s unemployment may finally be dropping sharply, but no one can say that with any confidence until the erroneous 2015 BLS adjustments are sorted out.